The Exhibition at Es Martell, Port of Ibiza, opened on the 5th July. Visitors were invited to participate in the Project by interacting with “The Bird” sculpture by artist Sophie Stinglhamber with an art video by Elise Guillaume and John Janssens. Another sculpture “The Dancer” was placed at the main square in Santa Eularia des Riu where visitors could also visit the preliminary works by the artist at the Centro Cultural de Jesús, in Jesús. On Friday, July 21, 2017 the sculptures were auctioned at Ibiza Gran Hotel with the collaboration of Lord Harry Dalmeny, UK Chairman of Sotheby's to raise funds for different projects to improve Ibiza's agriculture and almond industry. Today, there are as many Ibicencos as there are visitors on the island. However, its particular nature welcomes all these different faces with its hospitality that stems from its agriculture. In recent years the rapid growth and popularity of the island have caused its nature to suffer. With few actions we, the ones who want a healthy island (and world), can make this balance between growth and nature possible. Farmers on the island of Ibiza have selected their best seeds for many years and have preserved them so far. These endemic varieties of the island have almost disappeared if they had not been carefully harvested to create a seed bank. This bank aims to preserve the culture of these local varieties to recover the culinary flavors of the past. The funds collected by the project "LOS ALMENDROS DE IBIZA" will also be redistributed, among others, to the Grupo Leader of Acción Local of Ibiza y Formentera to extend the mission of the seed bank. 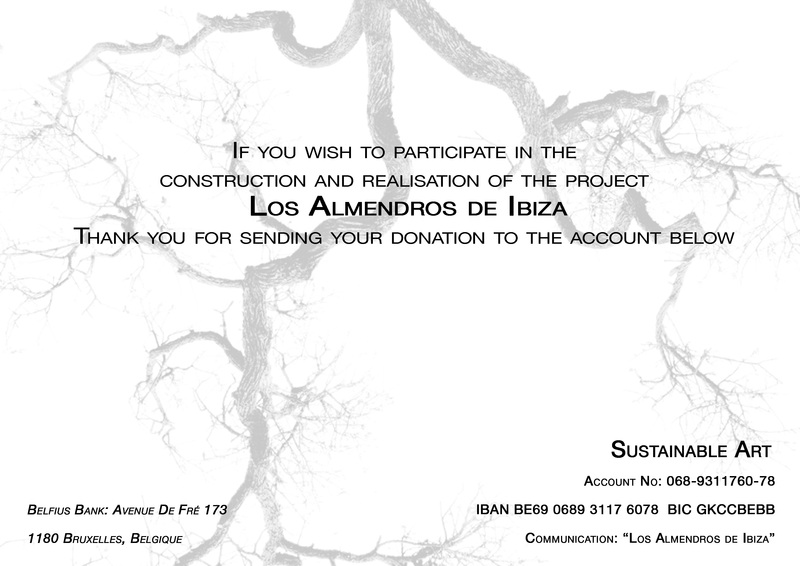 We invite you to participate in "LOS ALMENDROS DE IBIZA", your donation will make it real, together and now. To direct the attention of both public and institutions towards the urgent reality of the death of the almond trees in Ibiza and to raise funds to improve the current situation. We create an art installation that offers the interaction for both islanders and visitors, in order to create awareness and sensitize the community towards this problem, bearing in mind that an unresolved problem leads to new and more complex problems to be resolved. The sculpture will be auctioned on Friday, July 21, 2017 by Lord Harry Dalmeny, UK Chairman of Sotheby's at the port of Ibiza. We are very grateful for his collaboration. “When reality is experienced in its nature of ultimate perfection, an almond tree that may be in your front yard reveals its nature in perfect wholeness. The almond tree is itself truth, reality, your own self. Of all the people who have passed by your yard, how many have really seen the almond tree? The heart of an artist may be more sensitive; hopefully he or she will be able to see the tree in a deeper way than many others. Because of a more open heart, a certain communion already exists between the artist and the tree. What counts is your own heart. If your heart is not clouded by false views, you will be able to enter into a natural communion with the tree. The almond tree will be ready to reveal itself to you in complete wholeness. To see the almond tree is to see the way. One Zen Master, when asked to explain the wonder of reality, pointed to a cypress tree and said, “Look at the cypress tree over there”. The project "LOS ALMENDROS DE IBIZA" was born from the inspiration of the artist Sophie Stinglhamber, founder of SUSTAINABLE ART asbl, who found an ally in this adventure, the Curator Diego Alonso. Both in love with Ibiza, they decided to help protect the environment of the island. We are collaborating in this project, "LOS ALMENDROS DE IBIZA", to submit a problem of which little is spoken about and to put in motion actions to find a solution for Ibiza's land and almond trees. For this project, the cooperation and collaboration between the artist and the curator makes it possible to move forward in the interest of the objective set. The artist, through her creation, aims to get closer to the daily life of the visitors in order to make them aware of this cause. The curator, as a catalyst, brings together ideas and objectives to take them to institutional and historical functions in order to make them productive. Sophie Stinglhamber was born in Goma, Congo. The events of that time change the destiny of her family taking them to establish themselves on the Island of Ibiza. Sophie spends her childhood on the idyllic island of the 60's. With no fear and without danger, running across the almond tree fields. After her adolescence, she traveled to Belgium to complete her art studies at CAD (Centre des Arts Décoratifs) and at the Academy of Fine Arts in Brussels. She continues working in different creative disciplines among which fashion and fine jewelry designer which have led her to the creation of SUSTAINABLE ART asbl, LÔ EN CONSCIENCE and the CARD POST ART concept while establishing and managing the NGO ACTION INNOCENCE in Belgium. For her, art and its usefulness must be connected to the different actors who support the same cause. Her professional experience focuses on the memory of human evolution and its consequences on the mineral, vegetable, animal and human worlds. In order to express her ideas, she gets inspiration from different artistic currents, such as ephemeral art, environmental art, street art, conceptual art, immediate art and living art. In her artistic path she investigates different fields such as performances, installations and interactions. Between 2008 and 2015, her work evolves within closed spaces, focusing specially on the medium of photography integrating objects and sculpting over the photo paper searching to overcome the flat image to reach a new 3D vision. From 2015, she reflects and concentrates on the use of art and the relevance of producing art in-situ. Diego Alonso is the founder and director of MONDO GALERIA, art gallery dedicated to contemporary photography and design in Madrid and art projects in Ibiza. He holds a degree in Audiovisual Design from the University of Buenos Aires. His relation with Ibiza comes from early childhood and after his return from living in India during 10 years where he worked since the mid-1990s as a photographer and exhibition curator. After he moved to Italy until he settled in Madrid. He collaborated in cultural projects with the US Embassy in Madrid, the Alliance Française and the Italian Institute of Culture, the Museum of Memory and Tolerance in México, among other institutions. He collaborated with photo agencies such as Magnum Photo and Graphix-Images creating exhibitions and workshops for photographers such as Antoine D'Agata, Jacob Aue Sobol, Gueorgui Pinhassov and Laurent Zylberman. He has curated exhibitions for the University of Brasilia, for the Madrid City Council, for the Museo del Traje and for the Academy of Cinematographic Arts and Sciences of Spain. He has been jury for the Photography Awards City of Alcalá and is a professor in the Master of Photography for the Lens School of Audiovisual Arts. For his gallery, he has organized exhibitions by Man Ray, Lawrence Schiller, Franco Fontana, Alfred Wertheimer or Terry O´Neill among other represented young artists. In Ibiza he programmed the artistic content for BoKáo (2015), and created exhibitions for El Hotel Pacha, Atzaró, Centro Cultural de Jesús and for his own space in San Francisco, Salinas. At present he focuses his activity on managing curatorial projects for institutions and artists. Currently studying a Bachelor of Fine Art at Goldsmiths University London, Elise Guillaume has already exhibited internationally. Her work frequently explores human behaviour in relation to the environment. She has created performances, multi-screen videos and installations, sometimes to a very large scale. Today, her knowledge of fine art and videography are leading her to inquire video supports, incorporating roles of the fine artist and film director. Based in Belgium, John Janssens is visual content creator who specializes in cinematography. He had the opportunity to work with some inspiring crews on several short films, receiving recognition from festivals in 7 different countries, and winning the Arte Short Film Award in Munich (2015). His love of challenge and natural curiosity has brought him to explore videography through sport, fashion promos, events, making-offs and editing. Today, John has founded his company NAVAJO STUDIO and works on diverse projects, most of them aimed for the web. Bringing an alternative cinematographic style to this new kind of content. Her professional career has been atypical and varied with among others a regular collaboration with Sophie Stinglhamber as project support whether for her artistic projects or for the NGO she set up. She has not only enjoyed working in multicultural environments but also for individuals who have challenged her to continuously develop her organizational skills in multiple areas. This enables her today to share this experience as a freelancer with entrepreneurs in need of administrative tools set up and multilingual support (FR/UK/NL/SP), whether on a national or international level. José Planells Ferrer : It was a pleasure to collaborate during these few months with José, a man who knows what he is talking about. Between drawings and dialogues we have succeeded this symbiosis, entwining these sculptural trees and the man's hand . Thank you José for sharing your know-how. Oscar Cleries and his team Idris Choayb - Héctor Savedra : Extracted with meticulous care the almond trees with their roots from their cradle, under this hard ground, this will remain an unforgettable memory; a strong footprint in this work. Thank you all for your sympathy and professionalism. Hélène de Mévius for her kindness, her confidence and without whom this project could not have seen the light of day. Mr. Vicent Serra Serra and his wife, Mrs. Francisca Tur Serra, who kindly lent me their fields where "LOS ALMENDROS DE IBIZA" were born. These fields, which have become my open-air workshop, is one of the most outstanding that I have had so far. Maria Viñets for her kind help in translating texts into Ibicenco. Please do not hesitate to contact us for any inquiries or donations. We invite you to participate in the project "LOS ALMENDROS DE IBIZA", because each contribution counts, so that together and now your participation makes the difference. You may do so by clicking the Playpal button below. Thank you for support.